You are visiting the "Working" page. Links to the right will take you to sub-pages within the "Richard Smith" section. The links with asterisks in front will return you to either the parent or to the "Home" pages. Click on any thumbnail size image below to enlarge it, then click on your browser's back button to return to this page. This is a picture of Richard working Blue at the WBCS (Working Bearded Collie Society) Meet at Langdale in September of 2004. Blue is from Jimmy and Fen's first litter of pups born on December 5, 2003. She is less than one year of age in this photo. 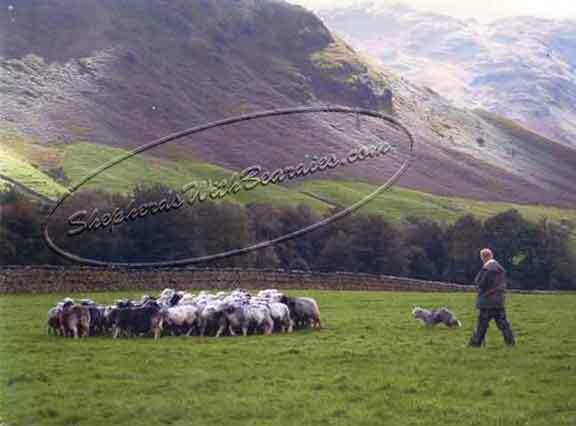 Blue was sold to a Head Shepherd, Andrew, who worked on a very large estate in Cumbria, England. Andrew was so pleased with Blue, her personality, football skills, intelligence and stamina that he phoned Richard to say if we had another Beardie he would buy it. He said she has incredible instinct for such a young Beardie. When two ewes were about to lamb, she would know which one was going to lamb first. 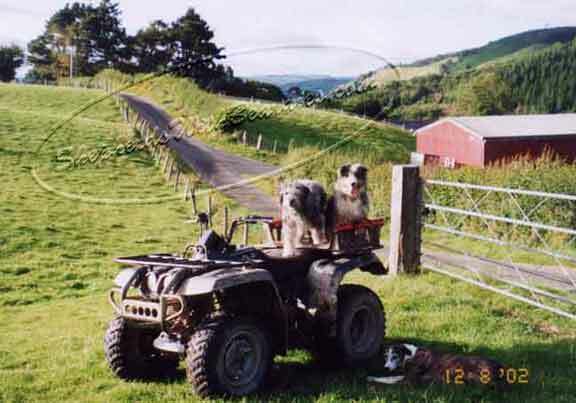 Jimmy and Fen on the back of the quad at the start of doing the rounds of checking the sheep. summer.Shearing can be back breaking work.